But when all else fails… quincy quiet for ½ hour coloring is golden! Easy enough. Ahhhh, I just bought a TON of supplies for the girls and they have been perfect little angels (okay almost perfect)....but that is just a WAY cute way that you organized it. Cute stuff. seriously copying this idea. what a wonderful thing--so fun, so creative and a little quiet time for mom to boot. gotta love it. also love the gifts for the teacher--gonna do that too but i still have 2 more weeks until our district is out. I think I need to go back! Thanks for the inspiration! Thanks so much for sharing this idea. Love it! I guess I'll be at Target this weekend! OK you outdid Rachel Ray big time!!! I love it!! You are so not a slacker...you put this together in less than 24 hours after I left. It looks like a great "baby sitter" for a few hours. I want this on my table and I don't have kids (but I do love doodling on the table while I wait for someone to bring me dinner)! Maybe I could invite my niece over a lot so I'd have an excuse! Love it! Keep those ideas coming. My husband is staying home with the kids and "Camp Dad" sure could use some fun ideas. Last year they learned how to seal coat the driveway and window replacement. I am going to make this for my table tomorrow! I am such a copycat! My kids can draw for hours! 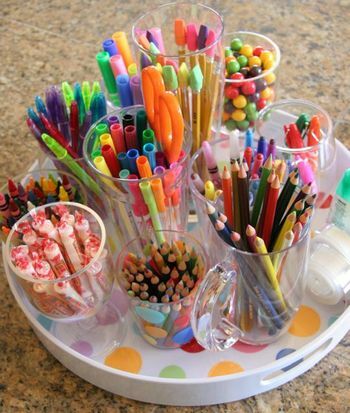 Wonderful, fun and functional center piece for kids!!!! Love it! I am heading to Target! Thanks for the inspiration! Very Cute! And VERY inspiring!! I did end up doing your beach towel and magazine idea for my daughter's teachers, and they LOVED it! Thank you for so much inspiration!! Awesome idea....I might try this idea for our upcoming family reunion. We have alot of small children. Thank you. awesome idea...I am off to target right now. What a great excuse to buy all those awesome bright colors Target has right now. I am loving the blue with the red strawberries myself (bought the strawberry placemats to decorate the walls in my DD bedroom! The fresh art supplies are on my list as well - now it's to make mommy happy too! Please share what you come up for kiddos this summer - I am in the same boat and getting there too! What a fun idea. No kids in my house but I just had to comment. The picture along looks so fun. Might need to incorporate that into scrapbooking somehow. Thanks for sharing Heidi! This is perfect. Who doesn't love brand new supplies and what a great way to insure that everything gets back in place when you are finished with it. Way cool idea, I am copying it ASAP. Much cuter than the shoe box with everything mixed up and broken, and missing lids that I usually have around.